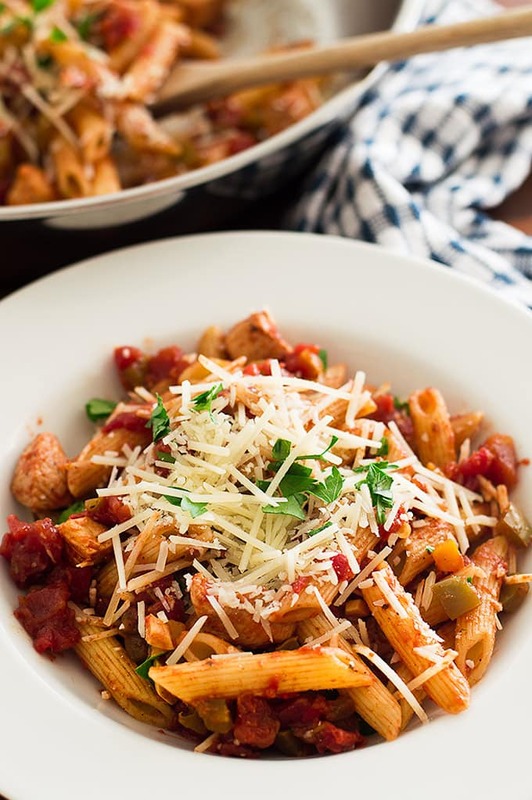 Light and easy Pasta Primavera with sweet crunchy bell peppers, tomatoes, and lean chicken breast served over penne pasta and topped with Parmesan cheese. It’s Monday! How was your weekend? Did you watch the Golden Globes last night? Did any of your favorites win? I’m an awards show junkie, so I made naan pizza for the occasion (OMG, so good, recipe coming soon) and happily settled in for three hours of beautiful people giving each other awards. I was super excited to see my fav, Olivia Colman get recognized, and oh man, those Viola Davis and Meryl Streep speeches were so great. Also, Kristen Bell has maybe inspired me to cut my hair into a lob again. Tell me not to do it, people. Talk me down from this ledge! Up there with other favorites like my Ham and Potato Soup (that recipe just got new photos, have you seen them? ), BLT Salad, and Peasant Soup, it’s one the recipes I make most often in my own kitchen, because it’s just a dinner you feel good about eating and making. 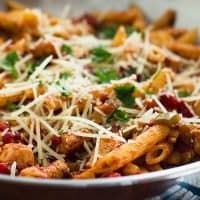 This easy Pasta Primavera is all about lots of veggies (okay, tomatoes are a fruit), some lean chicken breast, and a little bit of cheese coming together to make a damn good pasta. I love that it’s easy to make. I love that it’s a bit spicy and just a tiny bit sweet. And I love that it’s a nice and light pasta for those times when I desperately need some carbs in my life. Put a medium pot of salted water on to boil for the pasta and cook pasta according to package instructions. 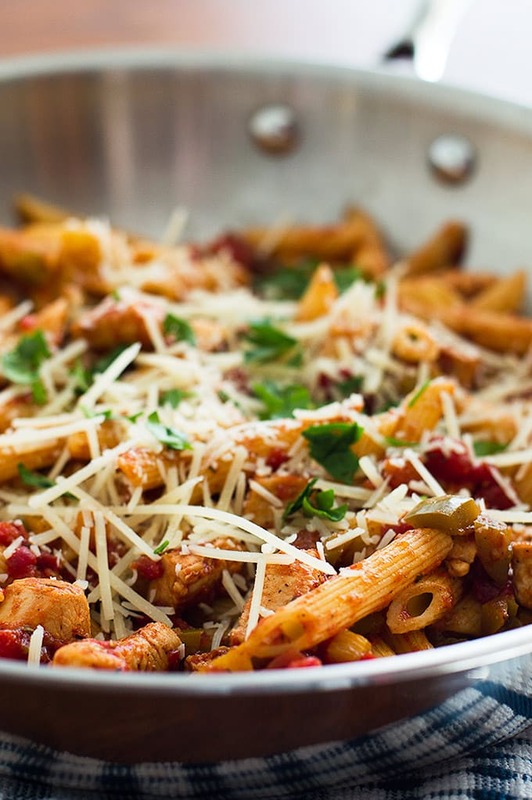 While your pasta is cooking, in a large skillet, over medium to medium-high heat, melt butter. Add chicken breast, sprinkle with salt, and cook until cooked through. Transfer cooked chicken to a plate and tent with foil to keep warm. Return pan to heat and add bell pepper and garlic. Cook over medium heat for 4 to 6 minutes, until vegetables just begin to soften. Add tomatoes and spices, bring to a simmer, and cook, stirring occasionally, until mixture becomes thick and saucy, about 6 to 10 minutes (different brands of tomatoes will vary). Stir in cooked chicken and simmer for 1 minute more or until chicken is hot. Stir in cooked pasta, dish up, and top with Parmesan cheese. Enjoy! This pasta sounds delicious! And with snow on the ground around here and it being super cold, this is just what I want! A big bowl of carby goodness 🙂 Looking forward to seeing that naan pizza recipe too 😉 Have a great week, Tracy! This is so my kinda dinner! Love the recipe. I never watch award shows. I know, I know, I don’t know what I’m missing. I just don’t like sitting through them for some reason. I love all pasta dishes, and I too can eat pasta primavera all year round. Thanks for this delicious looking dish! 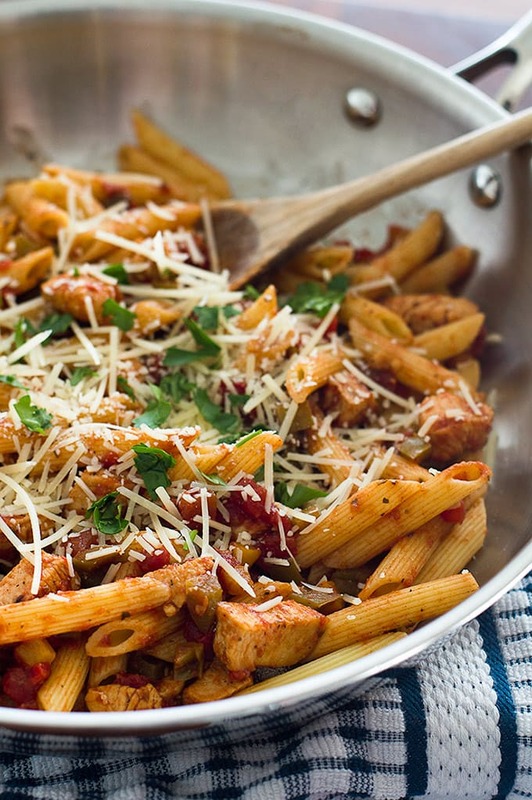 Oh goodness, this pasta for two is perfection! Your photos make me want to reach through the screen for a bite! Gorgeous! I’m always on the lookout for small recipes, I’m so excited! Thank you! Looks so delicious! This easy pasta primavera for two is a dish worthy as a date-night-in meal to share with the hubby! I’ll use my favorite gluten free penne of course. Add a big salad and our favorite wine and we’re all set! Sounds like a perfect date night! 😉 Thanks, Lindsay! This looks so tasty! I don’t know why, but pasta primavera just never makes it onto our menu. After reading this, I definitely want to give it a try. Thanks, Ali. You totally should!! This is so good, light/healthy recipe. This one is a keeper. Wishing you a Happy New Year Tracy. Thanks, Rahul! Happy New Year to you too! This sounds like such a healthy take on pasta! Not like you can ever make pasta truly ~healthy~, but I’m sure the chicken and veggies don”t hurt, right? 😉 Also I will totally NOT talk you out of cutting your hair into a lob because I’m totally considering the same thing! I had that cut last year and now I’m tempted to do it again. It’s just so much more fun than my standard long hair! Exactly, on the chicken and veggies! A bowl of pasta is so beautiful and comforting especially during winter. Looks delicious! I have not watched the Golden Globes live but saw Meryl Streep’s speech later, so powerful and touching. Have a great weekend!